Keep it to yourself. That used to be our family motto. We never talked about my sisters condition, especially not to anyone outside the family. We were private, and there was nothing anyone could to do help anyway. In high school, I started to rebel against our silence. I was beginning to learn who I was (headstrong) and what I wanted to do (make a difference). Being on the newspaper staff during this time helped me develop a voice, and despite my parents hesitancy, I wrote about my relationship with my sister. For the first time, our story became public. There is nothing heroic — or shameful — about our family. My sister has mild mental retardation, or more appropriately, she is a wonderful woman with intellectual and developmental disabilities (IDD). She is lively and clever, attends community college and job training, lives in a group home, and is a Special Olympics athlete. Nowadays, everyone around us knows of her achievements. They have seen her grow and blossom over the years. My parents and I have grown and blossomed along with her. After meeting and talking with other families we found that this informal support network mattered, that other people understood our experiences. Their friendship gave us strength. So my parents began telling our story and sharing their strength too. My parents now work tirelessly on FFASN (Friend and Families of Asians with Special Needs), a nonprofit they helped found to inform and empower parents and caregivers about what they can do for their loved ones. (Note: Despite the name, FFASN is for everyone, not just Asian families.) With other volunteers, my parents organize support meetings for parents, sports teams and musical activities for their children, and fun picnics and festivities for the community. They dedicate much of their resources to something they truly believe in. One of their most impressive undertakings so far was hosting the first FFASN community workshop earlier this year. The workshop focused on educating parents and caregivers about available resources, such as waiver programs. As a FFASN volunteer, I flew home to help out with the workshop. That day was moving in many ways. Watching my mild-mannered father open the workshop and encourage a room full of parents to be their childs advocate was especially inspiring. But the best part was hearing all the positive feedback from participants about how helpful the workshop was. One woman graciously told me, Really, thank you for doing this. But that the credit really belonged to all the wonderful volunteers who make FFASN possible. I never dreamed my parents would go from keep it to yourself to sharing their story and creating a nonprofit. After years of silence, they opened up in a big way. I wrote this column because I am incredibly inspired and amazed by their hard work and continued efforts to make not only my sisters life better, but other families lives as well. FFASN will be hosting its second community workshop, Long Term Planning for People with Special Needs, on Saturday, Oct. 15, 2011 at the MHMRA Conference Center at 7033 SW Freeway, Houston, Texas 77074. Early registration encouraged, seating is limited to 100. There is a $10 registration fee for attendees and lunch is provided. To learn more about the workshop or FFASN, please visit www.ffasn.org or email FFASN.Houston [at] gmail [dot] com — or feel free to email Angie at JBUcolumn [at] gmail [dot] com as she will be attending the workshop. Since 9/11 attacks in 2001, Government and federal agencies became more alert on any suspicious activity. 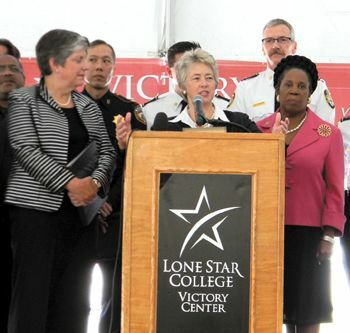 On September 20, at LSC-Victory Center, Janet Napolitano, Secretary of the Department of Homeland Security announced the partnership with the city of Houston on “If You See Something, Say Something,” initiative. They want the public’s help to report any suspicious activity in order to prevent a terrorist aTtack in Houston area. To report any suspicious activity, call 1-855-I-WATCH4 (855-492-8244) or submit a report online at www.iWatchHouston.org. As a tradition, the 26th annual law enforcement exposition was celebrated at Greenspoint Mall last Saturday, Sept. 17. During the opening ceremony Rep. Gene Green pointed out that without a law enforcement we could not have a safe coomunity. “We could not have a succefull community at Greenspoint, Intercontinental Airport and surrounding areas with out the cooperation of law enforcement,” said Rep. Green. Sheriff Adrian Garcia recognized all the hard work officers had done for the community and mentioned a new App for cell phones called iWatch for crime tips. Outside the Greenspoint Mall, there were firefighters trucks, a helicopter, police cars, and boats, mounted police officers, a robot use to deactivate bombs. The Law Expo every year at Greenspoint Mall gives opportunity to people to look closer to law enforcement equipment used for responding to citizens’ emergency calls. The law enforcement equipment is available for the public to view and get inside of it. Lone Star College-North Harris held a grand opening ceremony on Thursday, Sept. 15 for its new full-service center, LSC-Victory Center, located in the northwest Houston neighborhoods of Acres Homes and Inwood Forest. The 85,000 square foot facility opened to students with the start of the fall semester and has expanded higher education options for the nearby communities. More than 1,300 students are already enrolled, which is a 55 percent increase compared to the previous fall at the area’s former facility, LSC-Carver Center. Located on a 17-acre site at the corner of Victory and Vogel, LSC-Victory Center is home to diverse academic classes, essential workforce training in high-demand fields, and critical adult education such as GED preparation and English classes for non-native speakers. “Our vision was about serving the community and having a partnership with the community. This facility is focused on education, but not just academic education. We also want to teach responsible citizenship, hard work, discipline and perseverance. What we are trying to do is give people the skills to be successful in college so that they can give back and be successful in the community,” said Dr. Steve Head, president of LSC-North Harris. The site also houses the college’s partnership with Aldine ISD, the Victory Early College High School, where selected students can pursue a high school diploma and associate degree from the college simultaneously. Academy for Lifelong Learning and Small Business Development Center offerings solidify the center as a valuable resource for the entire community. Dr. Richard Carpenter, chancellor of the Lone Star College System, spoke about the center’s impact on the community. “This new state-of-the-art higher education center clearly represents an investment in our students’ future. It also represents an investment in the community. What we are dedicating here today will affect generations to come. Together, we are opening doors to brighter futures,” said Dr. Carpenter. LSC-Victory Center, which is the first major construction project in an area seeking revitalization, was also recognized for the potential impact it can have on Houston’s workforce. In June, Lone Star College System announced that it had received a $1.4 million grant from the U.S. Economic Development Administration (EDA) to help build the LSC-Victory Center and establish a vocational training center designed to provide workers with the critical skills needed to compete for higher-skill, living-wage job opportunities. The state-of-the-art center also offers several workforce specific training labs. These labs allow the center to offer hands-on training in high-demand fields such as HVAC and welding. Students in these programs can gain the skills needed to start a new career, often in just 12 to 18 months. “We are trying to get students in and out with training that pays a good salary. We’ve set the program up so that they can come through that piece of it and get out of it in about a year. Then, if they want to come back later and get a college degree we can articulate those classes back and help them reach that goal as well,” said Dr. Head. “LSC-Victory Center certainly showcases the many opportunities that Lone Star College System offers. It has all of the offerings that make up the core of the community college mission,” he added. 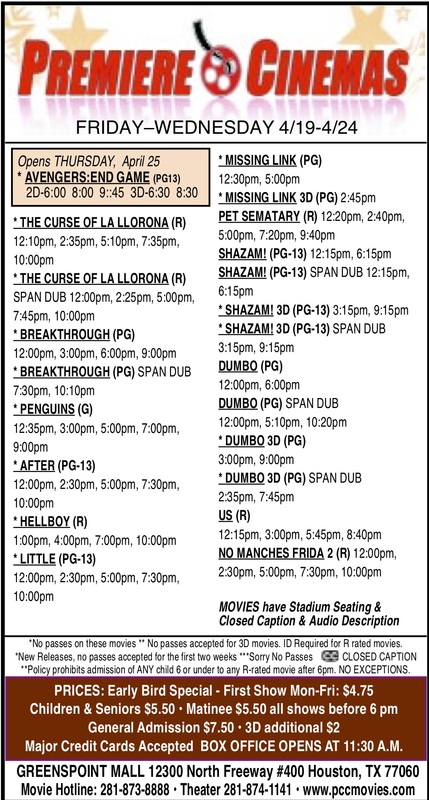 NORTHEAST– The Houston Intercontinental Chamber has lined up several blockbuster events for the next few months. Last Thursday the Transportation Summit was one of these, as hundreds of city and county leaders gathered at the Marriott Hotel Airport, to hear three experts talk about transportation trends in their respective fields. The experts were Harris County Judge Ed Emmett, speaking on his experience in rail, roads, and shipping; METRO CEO George Greanias, speaking on commuter transportation and how it interacts with other types of transportation; and Mario Diaz, Director of Aviation for the Houston Airport Systems, speaking on the global aspects of air transport, and how it relates to local systems. Each speaker not only talked on the technical aspects of their transportation knowledge, but also on how the national and local economy relate to, and benefit from, an advanced and integrated transportation system. The chamber president, Reggie Gray, welcomed guests and members, and spoke about the Chamber’s 25th anniversary year, and the Starlight Business Awards banquet to be held on Nov. 10th. He reported briefly on the California Expo attended by Greenspoint leaders, contacting potential international businesses to locate here. To emphasize the international aspect of our chamber, he said we now have a working relationship between the Dubai Airport Freezone and HICC and NHEDC. Also, he invited everyone to the next HICC event, which is a Healthcare Summit on Oct. 6th, taking place from 8:30 a.m. to 1:00 p.m. in conjunction with the Houston Northwest Medical Center. The featured speaker will be David Cordani, CEO of CIGNA Corporation. The Transportation Summit included a review by Judge Emmett of the County’s role in transportation. With 2 million people living outside Beltway 8, moving them is a major responsibility. Current road projects include extending the Hardy Toll Road into the center of Houston, and completing more segments of the Grand Parkway (Hwy 99). Rail projects include developing the Hempstead line, possibly as far as Austin, and the Galveston Line along Hwy. 3. He emphasized that it must tie into the METRO system to be most efficient. Also being studied is high speed rail from Houston to DFW in Dallas. Emmett emphasized that all of these projects are necessary, but the main problem will be how to pay for them, and we must act now to prepare. METRO’s Greanias spoke on the large service area his agency is responsible for, 1,300 square miles, with an employment population of 4.5 million people by 2040. In addition to 2 new light rail lines, his budget includes many street and road projects in local jurisdictions. Diaz spoke about Airport projects, including the plans to improve Ellington Field as well as the two passenger airports. Diaz said that most of the growth in airport business has been global travel and shipping. In the last year, for instance, there was 0% growth in domestic traffic, but 5% growth in international traffic. This trend is expected to continue, with more airlines, such as Southwest, looking at international flights for revenue production. To prepare for larger planes, Intercontinental airport will have to enlarge to receive the A380 Airbus, which cannot now land at IAH. However, the new Boeing 787 and 747-800 can be accomodated now. Diaz emphasized that all of this growth must be adequately funded to happen. From the audience, Greenspoint’s Jack Drake reinforced the idea that the public must become advocates to the legislature for more adequate transportation and public transit funds. The Greenspoint District and the Houston Intercontinental Chamber of Commerce traveled to southern California recently to attend a convention and expo aimed at helping Mexican entrepreneurs expand or move their business to the United States. The Mexico Emprende Conference was held at the Los Angeles Convention Center and brought together a range of service providers, entrepreneurs, government agencies and companies interested in doing business in Mexico and the United States. “We were honored to be invited to the event,” said Greenspoint District Executive Vice President Jerry Lowry. “We made many connections and met a lot of people who wanted to bring their business to Greenspoint.” The Greenspoint District and the Houston Intercontinental Chamber of Commerce were invited to the convention by Alejandro del Valle and Lucia Marcellini, two successful business owners who opened The Hispanic Business Center- HBC Executive Suites in Greenspoint last year. The Hispanic Business Center- HBC Executive Suites serves Mexican entrepreneurs who want to grow their business by breaking into the Houston market. The center, which is located in the Greenspoint District, can help accelerate growth of a company that is new to the United States by offering corporate offices for rent, a fully bilingual support staff and advisory support for business development. The Greenspoint District, along with del Valle and Houston Intercontinental Chamber of Commerce President Reggie Gray, hosted a booth at the expo and provided information about the North Houston market and the strengths of a Houston location. The North Houston team was the only convention participant promoting an area outside of southern California or Mexico and therefore garnered a lot of attention. Gray and del Valle hosted a seminar at the event called Houston: The Gateway to the Globe. The seminar focused on helping businesses further expand between Mexico and the United States. 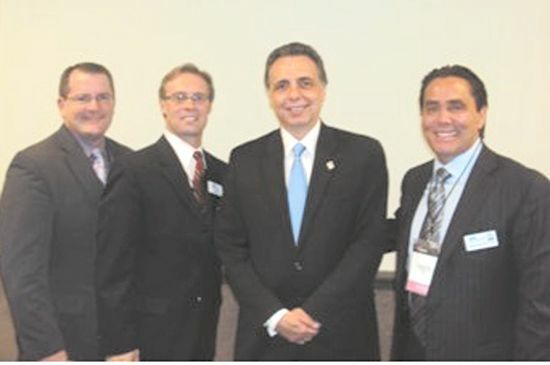 The north Houston team also had the opportunity to meet Mexico Secretary of Economy Bruno Ferrari during a lunch event. 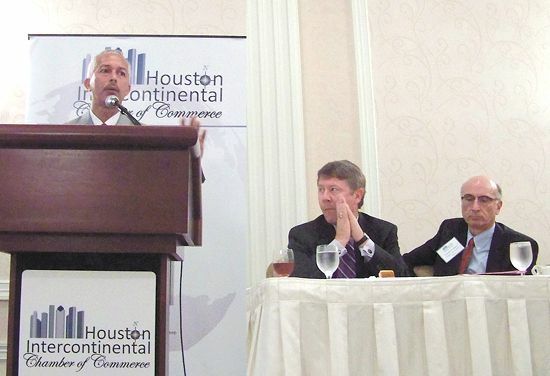 Both the Houston Intercontinental Chamber and the Greenspoint District have seen increased interest from international investors and business owners looking to grow their companies in Houston. The Greenspoint District is positioning itself to become a resource for international entrepreneurs and is stepping up its international marketing efforts. Gray has traveled to Mexico twice this year to meet with the Mexican business community and promote the area. Lowry also plans to travel to Mexico later this year. 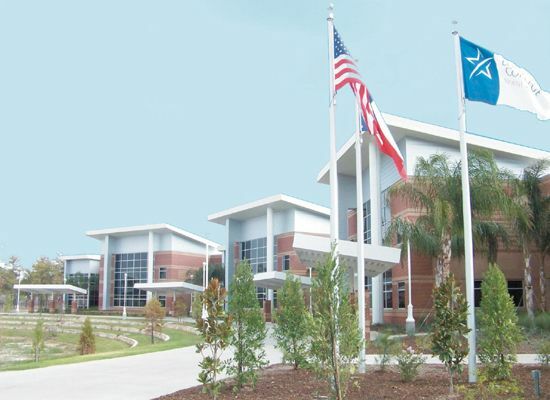 NORTH FOREST– This beleagured school district continues with a multiple faceted plan to turn around academic and financial standings with the state, and through appeals gain status to forego a closure order from the Texas Education Agency. At last Monday’s board meeting, acting Superintendent Edna Forté presented details of this plan, called “Project Transformation.” Helping with the presentation was North Forest High School’s new principal, James Troutman. Forté emphasized changes and improvements at the High School, where the TEA accountability rating has been Unacceptable and helped pull the District into the same rating. To help with the transformation, the board approved contracts with two educational consultants, approved a modest tax increase, and hired an additional associate principal for the high school. They also approved a new Employee Handbook, and confirmed the hiring of a new Athletic Director and Football Coach. The new AD is Darrell Hawkins, the new football coach is Plez Atkins. Project Transformation, as explained by Forté, consists of three components: Academic achievement, sound Financial Policy, and reestablishing Public Trust. This is accomplished in eight steps, she said. Eighth, lead change with communication, acting on collected data, optimizing educational conditions, and be willing to discontinue failing strategies. The board adopted a new tax rate for the 2011-12 school year, of $1.469292 total, compared with $1.37 last year. This amount reflects a 9 cent increase in the I & S Fund tax, which does not require voter approval, only board action. This was recommended by the external auditor, Mr. Karr, and was less than originally proposed in the public notice. The auditor emphasized that due to an increase in the overall appraised property in the District of about $76 million, the District will receive about $1,300,000 additional funds in their budget. The increase in the tax rate will mean only about a $10 increase in the average home in the district. The District has reduced its overall budget this year, from $51.3 million last year to about $47.6 million this year, with a small surplus of $500,000 projected to build up the reserve fund as required. The board voted to hire an education consultant familiar with this type of demographic, Dr. Pedro Noguera of NYU School for Urban Education, and a firm LEAD4Ward, to aid in implementing and assessing the new Texas STAAR tests. Dr. Noguera is co-author of a book, “Unfinished Business” about education in an urban minority district in New Jersey, and the ability to reform it. 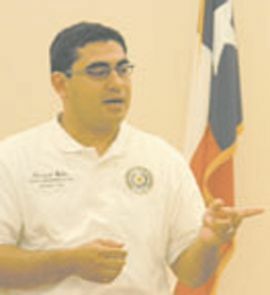 AUSTIN — Several pieces of legislation passed by State Representative Armando Walle (D-Houston) will go into effect September 1, 2011. Rep. Walle passed a package of laws taking effect today that are designed to help appropriately address disciplinary problems and keep at-risk youth out of the jailhouse and in the schoolhouse. House Bill 350 now allows juveniles charged with Class C misdemeanors at school to dispose of their sentences with community service or tutoring hours, in lieu of paying a fine. “Disciplinary problems are a red flag that a child is at risk of dropping out of school, so it is important for our courts to offer consequences that appropriately address the discipline problems and help students stay in school,” said Rep. Walle. Rep. Walle successfully shepherded Senate Bills 61 and 209 through the legislative process, which also take effect today. These bills are designed to ensure that youth in municipal and justice of the peace courts are given the best chance for success. The bills will make certain that juvenile case managers have necessary training and require that they report to the appropriate judge. “These changes in law will ensure that court-involved youth have access to folks who can give them the best chance possible to get back on the right track,” said Rep. Walle. Rep. Walle also passed legislation by amending other bills. Rep. Walle’s House Bill 206 was passed as an amendment to Senate Bill 573, requiring water utility companies to explain to their customers the reasons behind a rate increase and to provide resources for low-income ratepayers. Rep. Walle’s House Bill 2723 was also passed this way, as an amendment to House Bill 1951, requiring that health insurance companies give policyholders adequate notice of changes to their coverage or rate increases. Both measures will take effect today. Other measures passed by Rep. Walle, including House Bill 710 and House Bill 1341, took effect earlier this year. H.B. 710 saves the state millions of dollars by granting the Health and Human Services Commission greater latitude in using appropriate technology to detect and prevent fraud. The cost-saving measure reduces red tape for applicants and dedicates more taxpayer dollars to vital state services. H.B. 1341 gives universities greater flexibility in setting tuition payment deadlines based upon the characteristics of the student body.